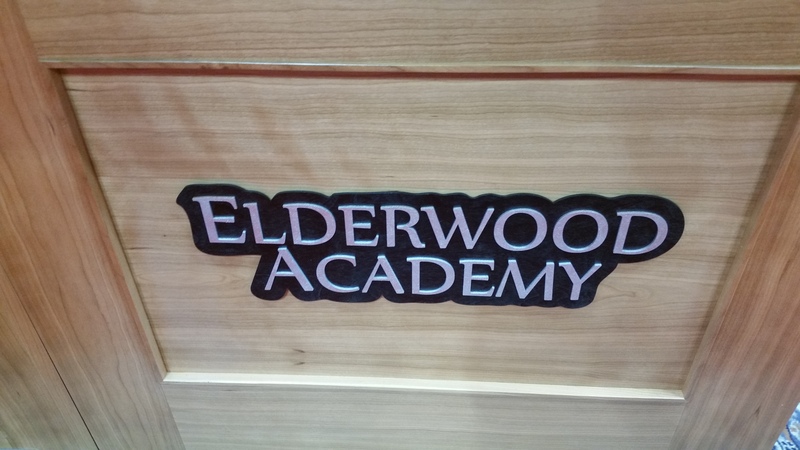 Let me begin by saying, I will not temper my enthusiastic endorsement of Elderwood Academy products in this Spotlight. I will take every effort to give a fair and balanced accounting of their products but have found nothing but the highest levels of craftsmanship and praise-worthy detail. So if you are looking for some very cool, very unique gaming accoutrements, then read on! It was an immediate eye-grabber on the convention floor. 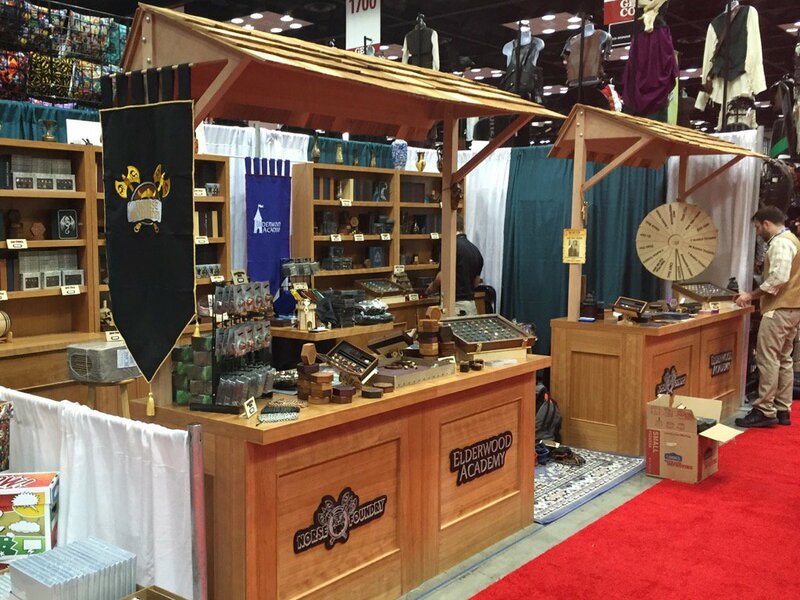 It feels maybe a bit needless to try and convey the grandeur of their booth space after the convention is said and done for the year, but I feel it really did a lot to show the dedication they have to quality and production value, which is mirrored in their products. As an added bonus? They had a scavenger hunt in their booth! It was actually a very fun little deviation and a great excuse to drool over their wares at length while looking for the hidden details they slipped into their space. Why point this out in the wake of the Con? Again: Production value. Everything Elderwood Academy does is top notch. Case in point: Their trademark “Spellbooks”. 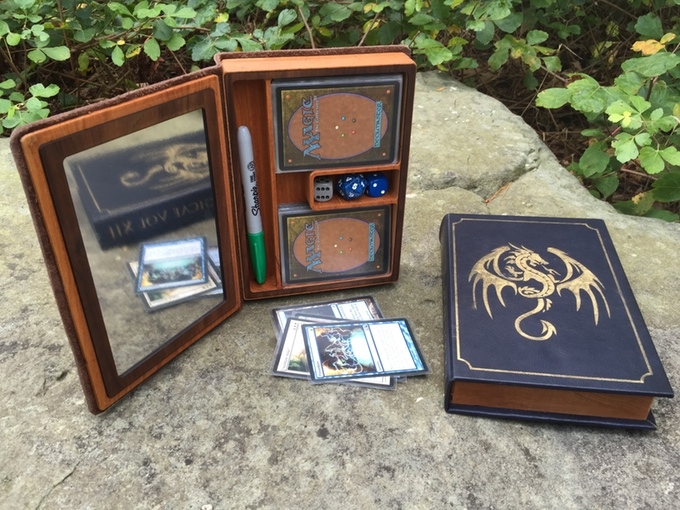 At a bare minimum the spellbooks are a clever accessory for a variety of gamers, and at their utmost they are a hugely customizable show-piece to inspire envy in your fellow gamers. 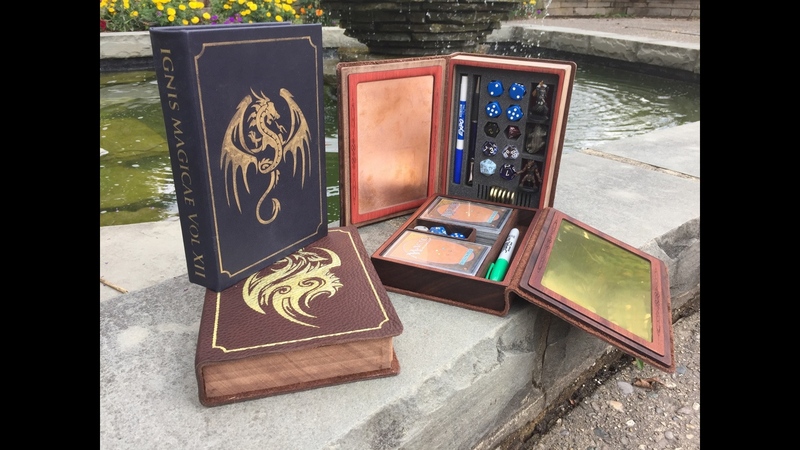 In the words of their HUGELY successful Kickstarter, the spellbooks are “a gaming box designed to feel like an arcane tome and crafted to capture the timeless appeal of classic leather, wood, and metal. 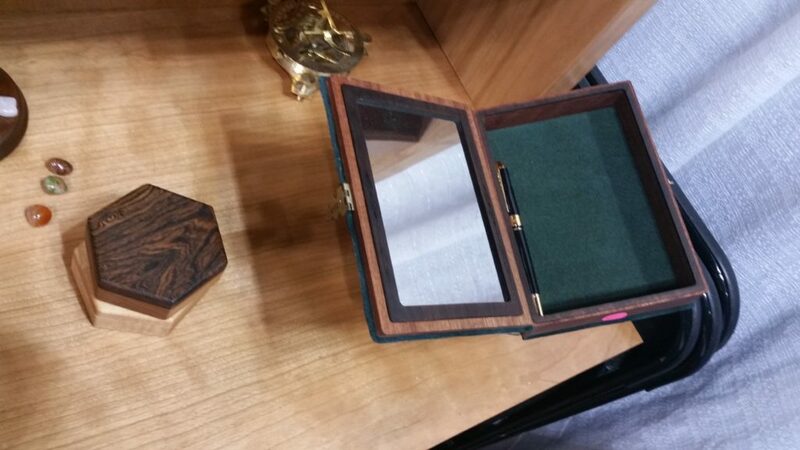 Spellbooks are stylish and functional reliquaries for your favorite gaming gear. They come in two basic styles; “card deck” and “rolling tray.” The card deck is made for trading card games like Magic: The Gathering, while the rolling tray is for the generalists out there. You can further personalize the rolling tray interior with removable foam inserts cut to a variety of templates. Inside the cover is a new Elderwood feature: the Reflecting Pool. Each Pool is crafted out of a variety of metals and acts as a fully functional dry erase board to keep track of temporary stats. 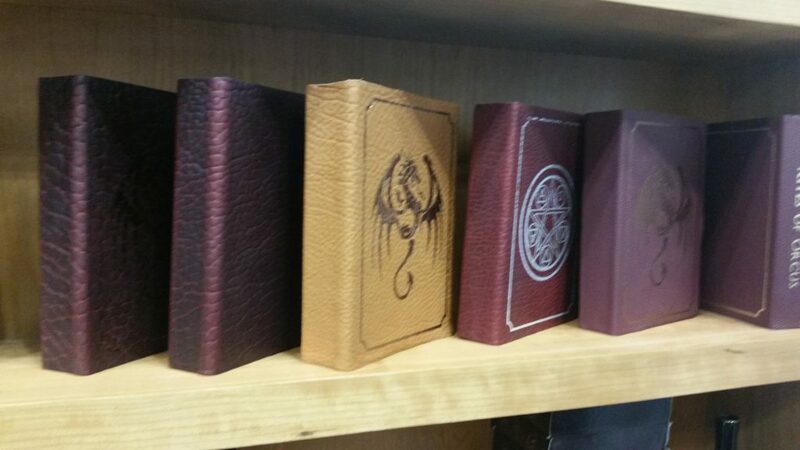 As previously mentioned, they are massively open for customization, from the color of the leather (including 3 kinds of “dragonscale” leather) to the images on the cover and binding, the type of wood utilized in your tome, the color of the felt, the style of the interior and even the depth of the spellbook itself. In the fairness of not simply spewing boundless praise on the spellbooks, of which I whole-heartedly believe they are deserving, I would have to say my one complaint is that the quality is so high. Hear me out: I would almost be afraid to use one regularly for fear of wear and tear. This is not to say they are not durable (they very much are), simply that any product you travel around with will see inevitable wear and tear, and when you mix how attached you would likely be to such a nice container and a $100+ base price. I would almost like to see some sort of lesser quality $50 base tier with minimal-to-no customization if it were possible for them to produce, so I could tote mine around without fear of dropping it or smashing it in a bag I set down. That said? “It’s too nice” is a wonderful point of critcism to have to dole out. For fans of Penny Arcade and PvP Online, there is even an “Acquisitions Inc. Employee Manual” variation out there in the world. How amazingly cool is that? For more information, visit http://www.elderwoodacademy.com/ and browse their site for more details.